With more than 2,000,000 users worldwide, Drawing Desk is bundled with 4 different drawing modes named as Kids Desk, Doodle Desk, Sketch Desk and Photo Desk, each dedicated to give unique experiences. MOST FAMOUS AMONG KIDS Kids Desk provides kids an opportunity to have fun in drawing. 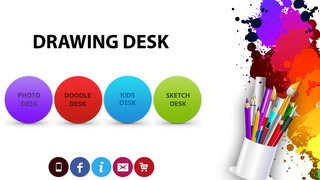 Kids can use the bunch of stamps, brushes and bright colors included in Kids Desk. All the brush and eraser sizes can be changed. Kids can enjoy drawing with music and magic wand drawing style. CREATIVE DOODLING WITH DRAWING DESK This is another effective drawing tool provided for all users. 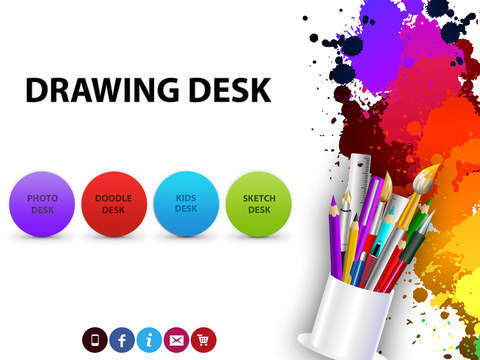 The collection of 3D brushes, full color pallet, undo and redo functions, and smooth erasing functions are also added similar to the Kids Desk. Also a collection of stamps and stickers are included. Users have the ability to import images from Facebook, instagram and other networks directly to canvas. Also can do their drawing in a device screen size drawing board. ENGAGING CREATIVITY WITH SKETCH DESK Sketch Desk is another attractive drawing tool which users can do their sketches with pen tools, pencil tools, paint brush tools, line tools and color pallet. users have the ability to carry out both undo and redo actions, smooth eraser functions. INSPIRING EFFECTS ON PHOTOS Photo Desk helps users to edit their images within a moment by tapping the screen. A collection of stamps and stickers, magic brush stroke effects, vibrant frames, live brushes are included in Photo Desk. A cropping feature is also included to crop only desired portion from photo. Furthermore users can import and export photos as preferred. DRAWING ON THE WEB Drawing on the web will allow users to import photos from Facebook, Instagram, flickr and Picasa to drawing canvas and export their drawings to popular social media networks such as Facebook and Twitter using a single touch.